There’s been some industrious craftiness happening at our house. 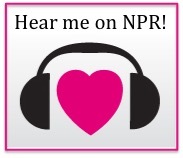 You may have noticed that I’ve never blogged about folk art, knitting, or scrap booking before. In fact, I was very crafty back when I was a pre-teen and teen living without a TV, but now I find that my kid and a few writing projects are plenty to keep me busy. But the subject of this post is a craft project that was born of serious necessity. It is a waste management issue, really. Our cloth diaper stash is falling apart. Most of our diapers are BumGenius pocket all-in-one diapers, and we bought many of them gently used. They are adjustable, so we were able to start using them once BabyC’s umbilical cord had fallen off, and she’s now wearing the same diapers on the medium setting. They should last until she transitions to underwear in another year or so. We love them, truly. The only problem we have run into is that the velcro has worn out, especially on our second-hand diapers. It is not very satisfying to change a squirmy toddler and then have her run off, only to find her diaper resting in the crotch of her pants a few minutes later. To address this common problem, BumGenius offers velcro replacement kits for $1 apiece. 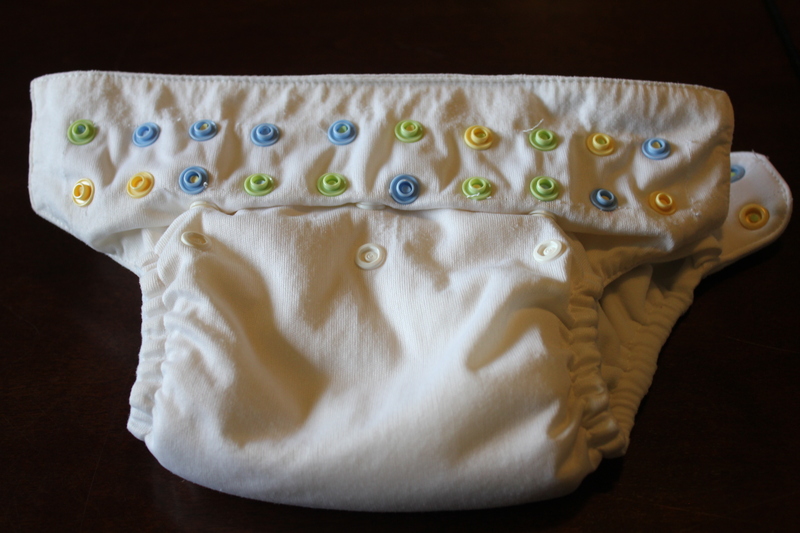 This is great, because these diapers are expensive, and if you have a sewing machine, this gives you an easy fix. Problem is, we want these diapers to last for another child, and I know we’d have to replace the velcro several more times to make it through another kid. And we don’t have a sewing machine. 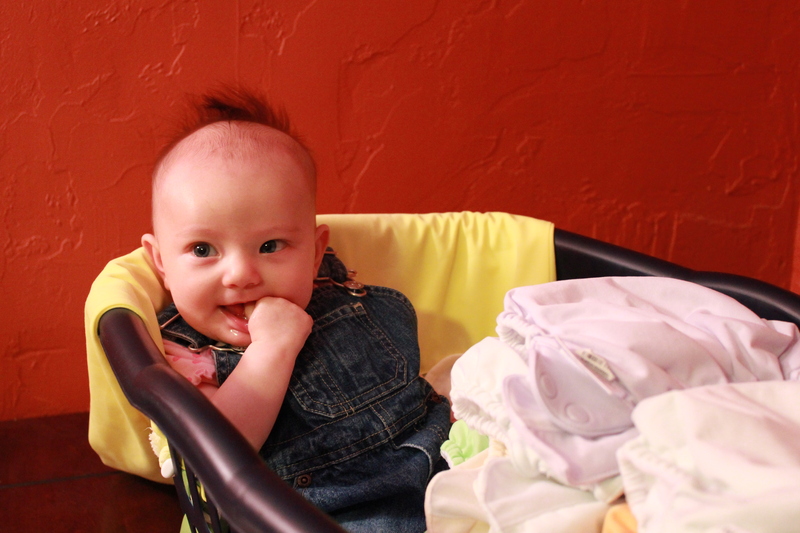 Plus, BabyC is at an age where she’s figured out velcro in general, and she thinks diaper removal is a fun project. We have a few diapers with snaps instead of velcro. During the early months, I was not a big fan of these. I found the snaps tricky when changing a fussy baby in the middle of a bleary night. Now that the velcro is failing us, I love the snap diapers. So when Husband suggested converting our velcro diapers to snaps, I was intrigued but also skeptical that it would be too difficult. I was wrong, which sometimes happens. We purchased snaps and a pair of snap pliers from KamSnaps.com. They actually carry matching snaps for the colors carried by the big diaper brands, but we just chose a few gender neutral colors and mixed them up. We found plenty of tutorials online for snap conversion (including YouTube videos), so I won’t bore you with the details. The process involves first removing the velcro with a stitch picker or, in our case, a scalpel (hey, you make use of what you have). Then you pop the snaps on using the pliers. The truth is, I couldn’t tell you how to do this project. Because the best part is that Husband has done it all. Why yes, he is pretty awesome. I think it takes him around 20 minutes per diaper, and he has quite a few to go. But it turns out that this project works well in front of an NBA playoff game, so I haven’t heard any complaints. I love our new snap diapers. I love the fun colors and the fact that BabyC can’t pull them off. 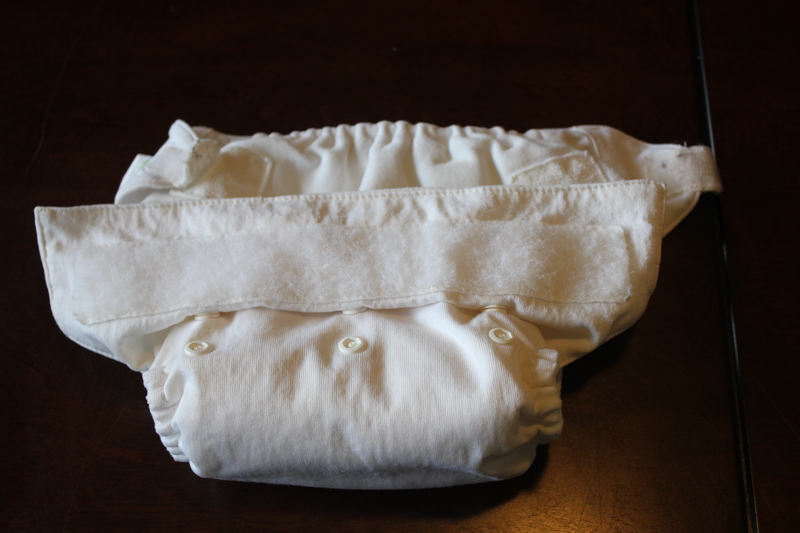 I love the idea that when the weather warms up, BabyC can run around in one of these diapers alone and it makes a cute all-in-one outfit and waste absorber. And I love the fact that I haven’t been the one doing the tedious job of picking out stitches. Very smart. I wish we’d had the foresight to buy the snap diapers in the first place, but then Husband would be missing out on this fun project. I’ve used snappis, and they’re great, but you really don’t need them with the diaper covers… although maybe they would have kept baby’s diaper in place while his cover migrated down his leg yesterday! Cool idea I will keep it in mind. That’s funny–my little guy had his diaper halfway off and down around one leg inside his pants today thanks to well-worn velcro. My hubby can’t figure out the cloth diapers, so it’s especially inspiring to hear that yours actually made them snappier! Thanks for the post. Good info! Yes, I knew I wasn’t alone with this problem! One thing my husband is good at is fixing things – he’s a tinkerer and a fixer. It hadn’t happened before today. He just figured out walking on Tuesday, and I think the new movement caused the saggy problem. Or… could it be that his diaper covers have gone through my daughter and cousin’s two kids? Luckily, I just bought some new covers that have snaps. Snaps don’t wear out in the laundry and they are harder for him to undo. Have a great night! Awesome! So glad I read your post. We have mainly snaps but there are 3 diapers that I don’t use because their Velcro has worn out. I am NOT a crafty person, so replacing the Velcro seemed daunting. I’ll give this a try! What a clever idea! I bought a combination of snaps and velco for our first grandchild. Daughter Number 1 has passed them to Daughter Number 2. Will definitely be keeping your idea in mind! You’re welcome:) It’s funny to me how I lived with worn-out velcro so long, until Husband finally suggested that we actually do something about it. Thank you for posting this! You didn’t just make your old diapers more usable again, I think you also made them look better! Love your choice of snap colors. They add some life to your white diaper. 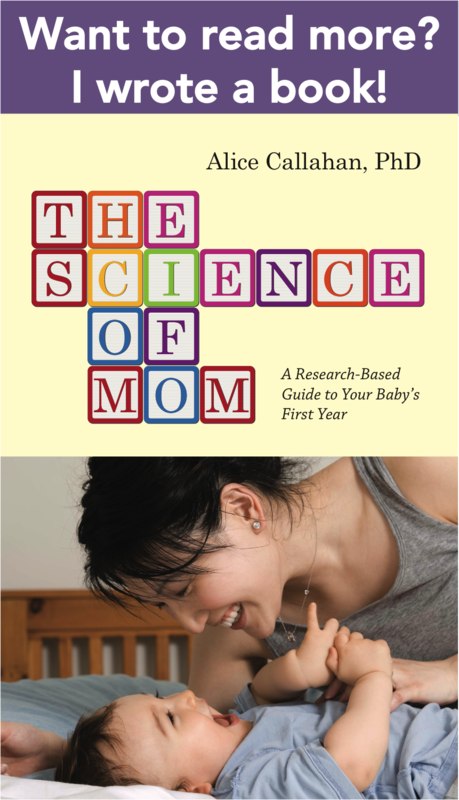 Good job, Mr. Science of Mom! See, I am finding the opposite. Most of my BGs are second hand and have done 2 years on Isabel and are now being used for Oliver. The velcro is bobbled but holding well. However, I’ve got a few BGs with poppers (snaps) and one had to be returned because the popper came out (it was only a week old!) and I’ve another doing the same after a few months. The fabric just seems to be tearing around the popper. Haven’t a clue what I’m doing wrong. Ugh, sorry! I remember it happened pretty quickly on ours, too, and it was suddenly evident which ones we’d purchased “gently used” and which we’d purchased new. Good luck with the conversion. You know, you can always replace the velcro too. I’m not sure that’s easier, but if you prefer the velcro to snaps, there is that option. Oh thank you for posting!! 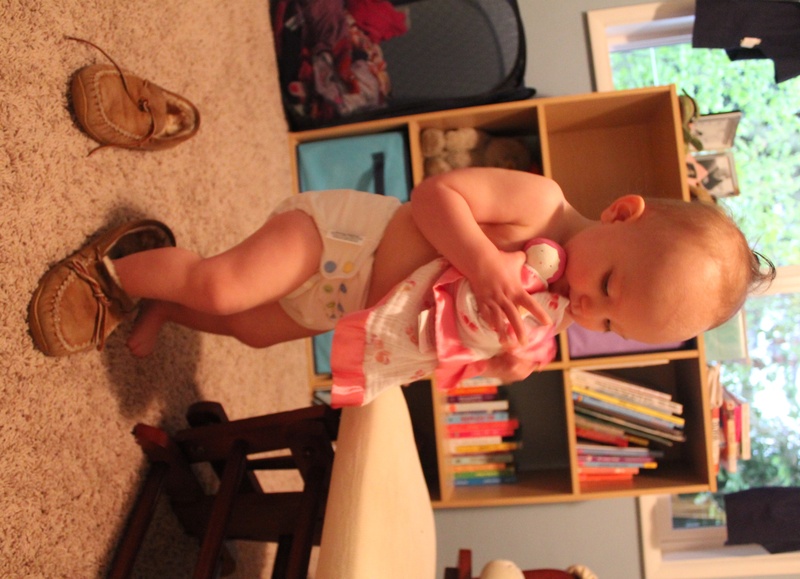 Our diapers are becoming useless, and I sing the praises of my three snap diapers to anyone who asks. Time to convert! I’m assuming that you bought size 20 snaps, but did you go with the regular cap prong length, or the long? Thank you Thank you for posting this! I am having the same problem with my BG 4.0s which were second hand but great when my LO was small, not so much now that she is crawling. I am going to try this, I thought it might be possible but didnt realize it was so easy. Thanks Again!! !